Untold Tales of Bigfoot is a comic story that I just discovered when I started talking to it’s creator Vince Dorse in a Art collective we are both apart. Vince Dorse is creating a beautiful story with wonderful art work that transports you into a lush land. Bigfoot is a sweet higher primate in search of a friend, the search is captured with talented camera shots and sincerity in its art. Dorse is in control of every panel he draws, and he draws with confidence. I highly recommend Untold Tales of Bigfoot. We exchanged fan art and I love the piece he sent me. It so atmospheric and deep, something I try to capture in Road Apples and it is done to perfection here. 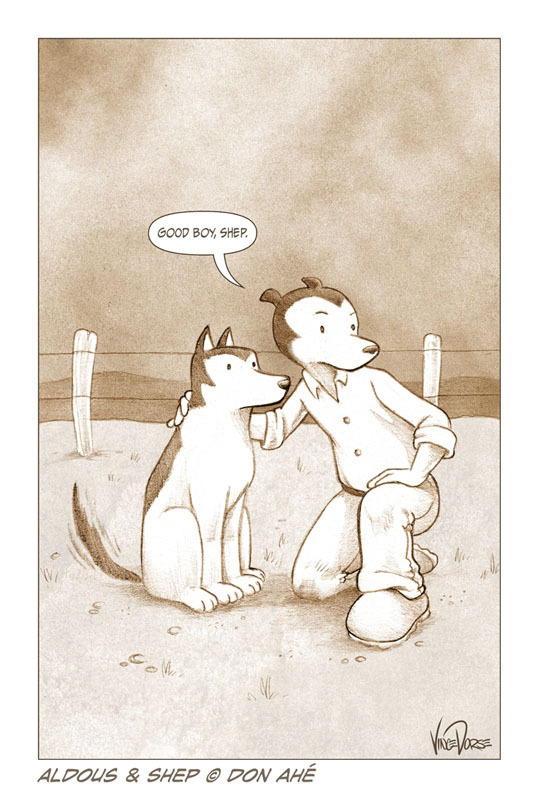 Shep and Aldous are wonderfully drawn and it was a joy to see them done in Vince’s clean style. You can see my fan art at Vince’s site Untold Tales of Bigfoot.